I had a quick look at the admin guide on subscription, but didn’t find any info how the renewal process works. For my server this will be due next month. Can anyone from Nethesis give some info on this? I don’t want any issues because of mistakes I could make in the renewal process. same situation here. 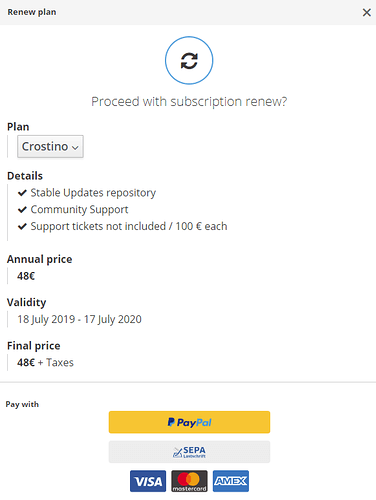 In january 2019 i payed 58,56 Euro via Paypal for an new subscription (renewal), but i never received them. My subscription ends next month. Can’t find that. Only button “upgrade” on my.nethserver.com. I think this is the right way, isn’t it? It’s correct I guess it’s what @transocean did. Right? exactly that was the steps i have done last january. But in Servermanager i can see that my subscription will end in april. 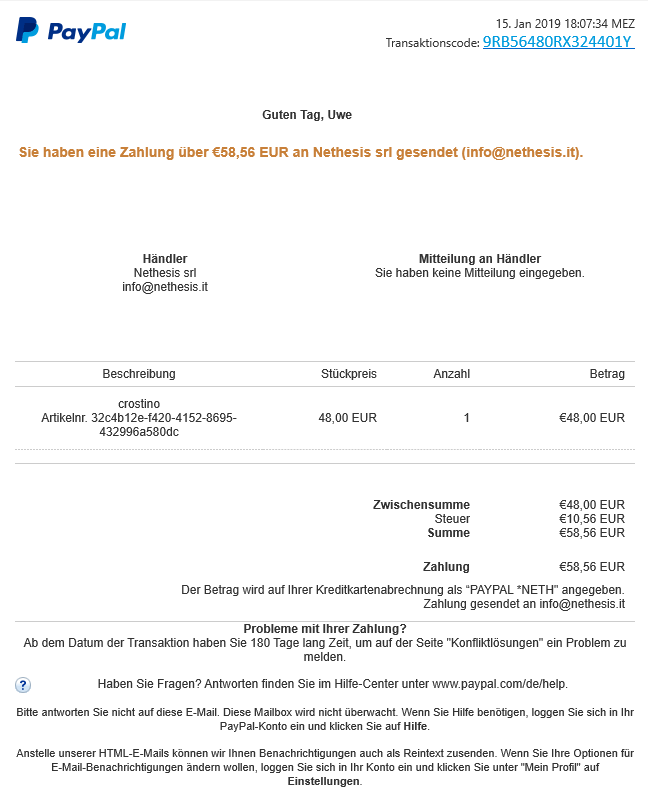 Also, i never got a mail from nethesis that confirms the payment. But in Servermanager i can see that my subscription will end in april. Thank you for reporting, we extended your subscription plan. Is it possible that as soon the renewal has been done, the new expiration date is shown? It should be the current behavior, but we probably hit a bug. We are investigating. So you clicked the “Upgrade” button and the systems proposed the renewal? Now everything looks fine in the server manager. Having trouble with mine as well. I just paid via PayPal for the renewal, but the payment doesn’t seem to be registering in the my.nethserver.com portal. Can you please send me a private message with payment details? I hope we could fix the issue soon. I just tried the renewal. I went through the paypal. The correct amount for crostino plan was deducted from my account. In my.nethserver.com the date is not updated. Also I received a message directcly after payment that no payment was received for the server… I think you need to (re)check your renewal procedure. Same happened to me–seems to be a problem with the PayPal integration. I’ve manually fixed your subscription. seems to be a problem with the PayPal integration. Yes it is, when the system searches for the payments, nothing is found. Probably something changed on PayPal API, we need to investigate. Thank you all for your patient, the problem should be fixed now for all plan renewal. If problem persists, or you have previous failed renewal which need to be fixed, please feel free to reach me with a private message. If you’re interested, this is the relevant commit. Just renewed without any problem. Dates updated correctly.